Last week Monday, the report was maybe unclear for some as ES was already so overbought on stall level that we anticipated day after day a reversal which never quite materialized. Some would have tried going aggressively short for minimal gains or losses, but most would follow our on-going advice to only "go with the flow" and we have to remember that we've never had any red bar on the daily chart. A lot of hesitation, a lot of anticipation and maybe some frustration too. ES is now more overbought than ever before so that much awaited pivot may just be around the corner so to say. 875 (which is a price attractor we mentioned last week already) is now so close (only 3 points away from Friday's high) that one almost can't imagine it not being hit. One should however be cautious of overly obvious targets though. Anyway... as always, we'll go with the flow and study ES behaviour as we approach our target. Here again, the MTFS white line shows no sign of abating just yet. It is clear however that reversal will be soon coming so we can prepare in anticipation for a retracement to the the high 790s or maybe lower. Same patterns, but difficult to say whether ES will hit 500 before retracing. 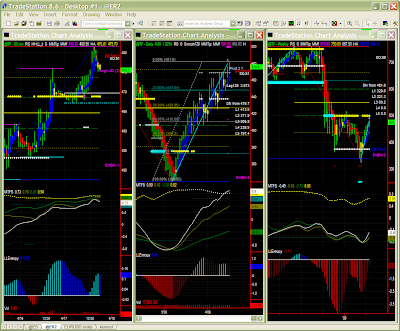 Again one should wait for a clear pivot confirmation and monitor (and possibly also trade) shorter time frames (e.g. 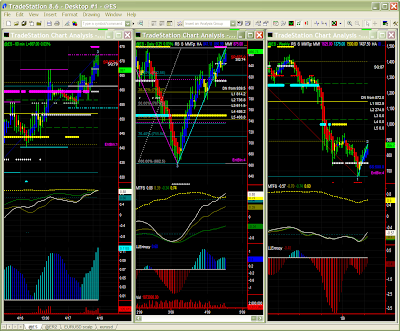 tick charts like 32000V bars or lower). We'll check for a key 858 level on ES for such confirmation (change of price segment).